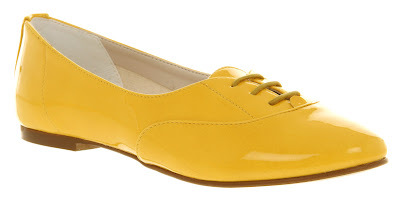 Yellow shoes: yet another thing I didn't think I needed in my life until Siany told me about them. She pointed out these loafers months ago, and since then I've been noticing bright yellow footwear everywhere. I think if we all wear them at once, spring will finally come out of hiding and grace us with its sunny presence. It's not often that a Clarks ad can stop me in my tracks as I flick through a magazine, but their current campaign featuring these Dollar Craze heels did just that. I love the delicate edging and chunky heel, and because they're Clarks you know you can run around in them all day without blisters. They're £54.99. I have coveted these mustard Irregular Choice shoes for ages but can't ever quite justify the £79.99 price tag. The ribbon laces, scalloped trim and houndstooth detail make them eminently touchable. You asked for more polka-dot shoes over on our Facebook page, and Dorothy Perkins has delivered. These espadrille wedges will have you skipping around all spring. They're £35 and will make you happy every time you look at your feet. 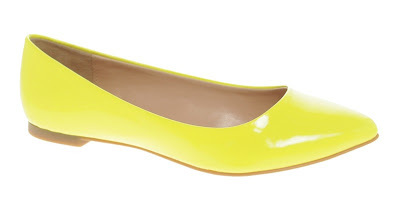 There are yellow ballet flats everywhere at the mo, but these ones from ALDO were the simplest, brightest, and - added bonus - the cheapest I found, at just £21 in the ASOS sale. Some more flats for you - these Matron leather pumps from Office should really be called Ooh, Matron! because they come in such an exciting range of colours. They're £55 and come in coral and bright blue if you're all yellowed out. I love the first pair. They remind me of a navy pair I had when I was in primary school. I lived them then. Presumably not quite such a high heel, though? ;-) You can get those Clarks ones in navy if you want to relive your youth. clicked on the link for yellow shoes from facebook because my daughter wants a yellow prom dress... suggestions? Check out Love Miss Daisy, Bella. Loads of vintage pretty - and often a yellow prom dress or two. Or try ASOS - they have a prom dress section that you can filter by colour. LOVE the super bright ones. I will wear them with dark denim. The "ow, my EYES!" Office ones? They're ace. I saw that EXACT advert in a magazine over the weekend, and I too was stopped in my tracks - those Clarks are going to be MASSIVE (bugger it, better get down there sharpish). It stops me every time! They look even nicer on. I'm rubbish in heels, but Clarks might be a good 'gateway heel', as it were. Perfect timing, I was going to search for yellow shoes on my lunch break, but you've done it for me. I want some to wear to a wedding next month and had been considering the Clarks ones, but now I'm very taken with the irregular choice. I've been lusting after those Clarks ones for weeks! They're much higher than I'd usually wear, but as you say, Clarks shoes are so comfy that I could probably get away with it. They're lovely, Allie. All of the Henderson range at Clarks is ticking my boxes. I'll be looking out for Yellow Shoes now though, just like you! Hooray for yellow flats, in that case - AND they mean we can run for the bus/not fall off our bar stools/still walk at the end of the night. Now the yellow shoes have magical powers that sober you up? Yes, Sian. Yes, they do. I've been dreaming about those Clarkes ones for weeks. Want them soooooo much! The polka dot ones are gorgeous too....they look so comfy!